Another new challenge site for me and one I so wish I'd found around July, then I wouldn't be rushing to make my own Christmas cards! I'm in the midst of trying to make some cards using a new set that was launched in the latest catalogue this August called Beautiful Season, so I decided to use the recipe to make them. 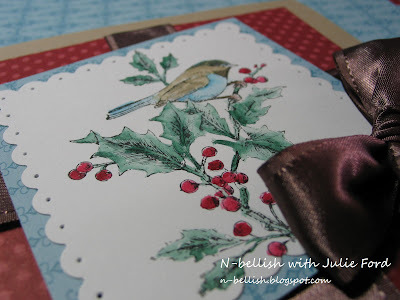 I started by stamping the large bird and holly image onto Whisper White cardstock where I then used my ink pads and aqua painter to water colour it. The colours I used were Basic Black - which is permanent water resistent ink, Cake Crumb, Marina Mist, ﻿Cherry Cobbler and Handsome Hunter. It took some time but I'm happy with the end result. The card base is Cake Crumb, scored to be a 14cm square. For the two designer papers I used the Regals Pack in Cherry Cobbler and Marina Mist. The Cobbler is the larger and I've used two pieces of satin ribbon to form a present wrapping look. I used a scallop square die and my BigShot machine to die cut the image out before paper piercing the border and mounting it onto the square of Marina Mist dsp. After playing with the image I decided it looked better not mounted on straight so that's how it ended up. I did mount it with dimensionals to raise it. Finally the bow was tied out of the same satin ribbon and mounted using a glue dot. Tools & Embellishments: Paper cutter, bone folder, snail adhesive, dimensionals, glue dots, paper snips, scallop square die, paper piercing kit, stain ribbon. Here's a super quick card for anyone who owns the two step bird punch. I think in all I made 20 of these in under half an hour. The base card is made from Riding Hood Red, which has a piece of Very Vanilla attached that I firstly punched the lower edge of using the Eyelet border punch. Before attaching the Very Vanilla I added a piece of ribbon. The bird is punched from Wild Wasabi and was attached using some snail adhesive. I used a black felt tip marker to outline the bird for a more 3D effect. Peaceful wishes sentiment is from a retired set but the For the Holidays Christmas Sentiment set in the current Idea Book & Catalogue. That set comes with four sentiments that are great for any Christmas cards. The brad is a little gold bell - non Stampin' Up! Tools & Embellishments: Paper cutter, bone folder, snail adhesive, paper snips, two step bird punch, eyelet border punch, ribbon and brad both non SU. In amongst making card examples and a personal stack for the Cards for the Troops, I realised I hadn't started any of my own Christmas cards this year. So keeping the train of thought and the production lines going I've been making a couple cards the same or similar to add to my pile. I missed buying the Sparkly & Bright set in the retired list but was fortunate that my up line manager had a brand new set she didn't want so I bought it off her. I am so pleased I did as I love it. 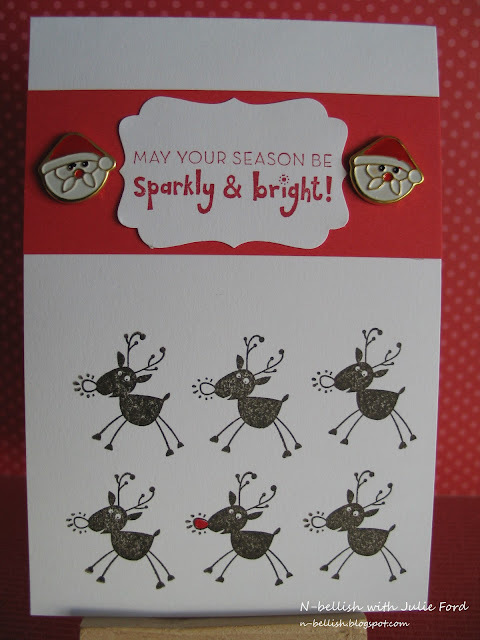 These cards as made using the reindeer stamp and sentiment only and are super fast as the reindeer are stamped straight onto the cardstock using Early Espresso Ink and a marker in Real Red. Lining up the reindeer wasn't as hard as I thought it would be as I just lined the wooden block up with the edge of the card blank and then used a ruler to do the top line. The sentiment is stamped using Real Red, punched using the Decorative Label Punch and then mounted onto a strip of left over Real Red cardstock. It comes together really quickly and looks great. I played around with some layouts to produce a couple of variations. Tools & Embellishments: Paper cutter, bone folder, snail adhesive, paper snips, designer label punch, paper piercing kit. 600 cards in 5 hours - how good is that! Well I might just say that I am exhausted. Today was the Williamtown Base Cards for the Troops and we made just shy of 600 cards in five hours. From creators, to stampers, to people who were happy to use the BigShot machine to die cut things. There was something for everyone to do. People who kept saying they weren't in the least bit creative certainly proved themselves wrong, as each and every card created was a marvel. Here's a couple photos of some cards I made with the ladies sitting with me. 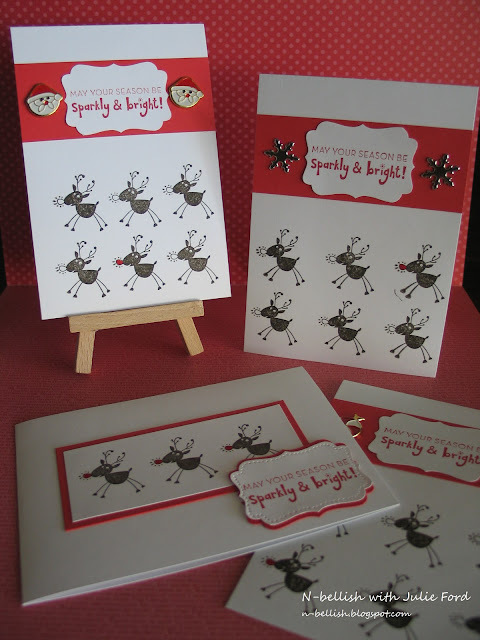 The cards all feature the Sparkly & Bright stamp set which unfortunately is retired now. I explained to the ladies that I think as a demonstrator it is worthwhile showcasing different cards that can be made using just one stamp set and a few coloured inks as it's great value for money then and means everyone can make something from a small stash of goodies. The reindeer was a real hit and quite a few cards featured him! There's more photos to come, and even an article in the RAAF Radar paper which I will add to my blog when it's published. Variety is the spice of life especially when it comes to crafting, so this morning I did a goggle search for some card challenges. I stumbled on upon one I've never participated in called Dutch Dare Card Challenges so I've decided to give it a go. It's a colour challenge this week using this photo. What amazing colours. As soon as I saw them I thought Pumpkin Pie, Chocolate Chip, Basic Black, Whisper White, Real Red and Glorious Green. Then the connection ta da - Halloween﻿. We are having some Halloween celebrations in the area we live next week and Noah is really excited about it and has already decided to be a super hero! He's so cute. 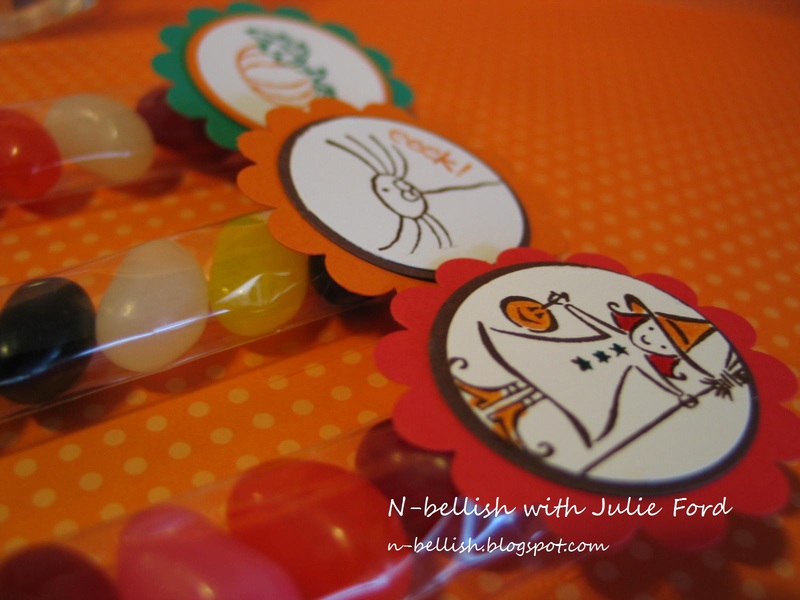 I've stamped some images to use to make some little treat bags which also fits into the SUO Challenge # 30- Treats are a Treat! I couldn't put them together until today as I could only find my jellybeans yesterday. 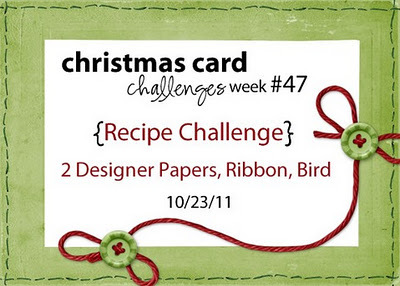 They're made using the new 1" x 8" skinny treat bags that have only yet been released in the Stampin' Up! USA catalogue ( If you're interested just email me ). They are perfect for these type of events and school presents. 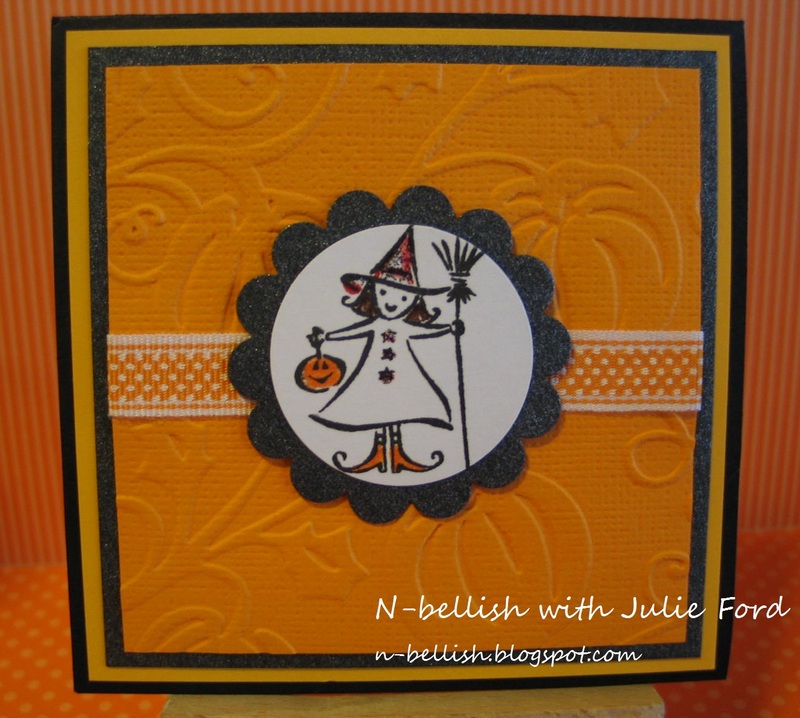 The card is made using the witch stamp from the Tag Time set (retired). She's stamped in Basic Black onto Whisper White cardstock, punched out using the 1 3/4 circle punch and then mounted onto a scallop circle punch. I coloured her in using the markers in Pumpkin Pie and Red Red inks. I added a touch of Dazzling Diamond glitter to make her sparkle. From the base of the card there is Basic Black, Summer Sun, Metallic Silver and Pumpkin Pie textured cardstock which I ran through my Bigshot machine using a Cuttlebug pumpkin embossing folder. All of it was stuck down with my snail adhesive and before adding the witch I attached a piece of ribbon. She's so cute! The treat bags I love! They are so versatile and I can see I am going to use them for so many different things. 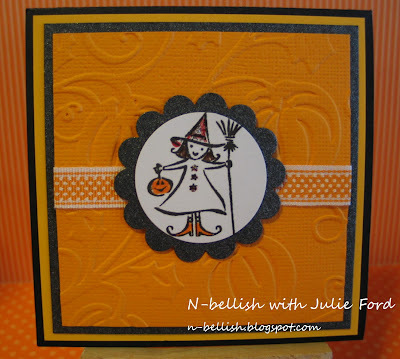 I again used the witch from the Tag Time set and the pumpkin also from the same set, and then found the little eeek! spider from the Tags So Much set. The witch was stamped with Chocolate Chip ink and then coloured with markers, and the pumpkin and spider I hand coloured using markers before stamping all on Whisper White cardstock. All of the images were then punched out using the 1 1/4" circle punch, layered onto a circle punched from the 1 3/4" circle punch and then finally onto the scallop circle. 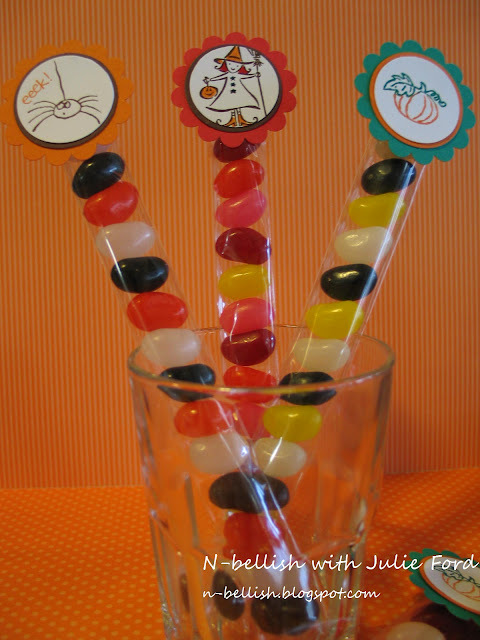 I then had to try and get the jellybeans into the bags which for the first few were a little tricky - but I succeded in the end and now have 45 of them to provide it! The embellishments were stuck onto the bags with one glue dot. I hope the little people in the area like them, though as my biggest fan Noah does I guess the first doesn't matter. Tools & Embellishments: Paper cutter, bone folder, snail adhesive, glue dots, paper snips, BigShot machine, Cuttlebug pumpkin embossing folder, ﻿1 1/4" & 1 3/4" circle punches, scallop circle punch, dazzling diamonds glitter, skinny treat bags, ribbon. Load of Christmas love in a ute. Ok, so for those who know me well I have the most amazing collection of brads - so many in fact it's a little overwhelming at times. This is though as I used to own an online store where I sold over 500 different shaped or sizes brads. I closed my online store when I relocated early this year so now have quite a stash at my disposal for personal use! My challenge for my Christmas cards is to ensure each and everyone has a brad on them and so far I'm doing well with this. I've a pile of these amazing Christmas trees which lend themselves perfectly to sitting in the back of the ute from the Loads of Love stamp set (IB&C p 41). 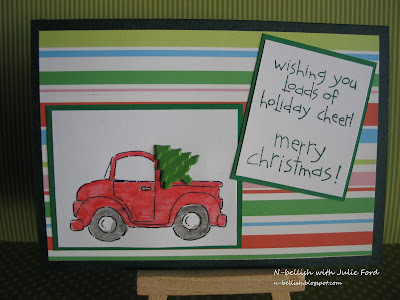 I stamped the ute onto Whisper White cardstock using the Basic Black permanent ink so that I could then use the water colour pencils and my aqua painter to colour the cab and wheels. 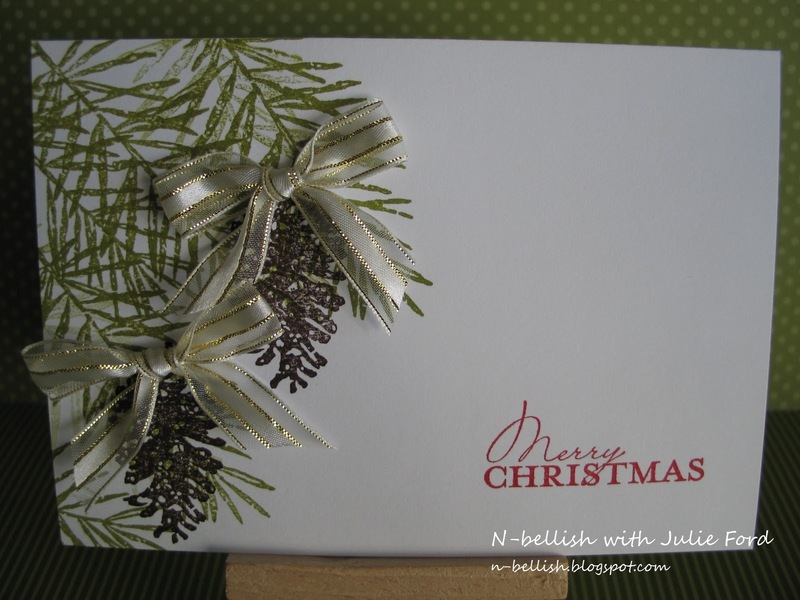 The sentiment is stamped in Garden Green ink again onto Whisper White. I them ﻿mouted the image and sentiment onto Garden Green cardstock, onto a card blank which I first attached a patterned paper to. To finished it off I added my Christmas tree brad. Tools & Embellishments: Paper cutter, bone folder, snail adhesive, dimensionals, glue dots, paper snips, water colour pencils, aqua painter, brad. Tomorrow there are a group of crafty people meeting at the Williamtown Air Force Base, here in Newcastle to make a multitude of Christmas cards for our Troops serving overseas. Having not been involved before I'm not sure how the day works, but I am looking forward to being involved. I have been asked to demonstrate some cards so I decided over the weekend and yesterday that I'd best make up some examples. The challenge has been to try to make some that don't take too long and don't require too many products to produce as I know cardstock is supplied but I am unsure what else is! I've already started packing my bits and bobs though so I've added in most of the bits I think we need to recreate my cards. This set used the Sparkly & Bright wood mount set, which I am sad to say retired in August but is so functional and I love. 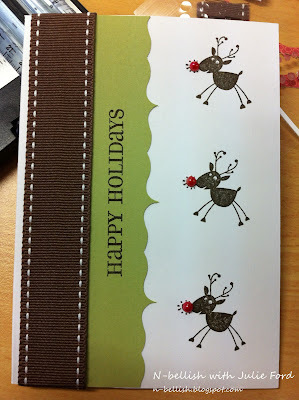 The little reindeer are stamped with Early Espresso ink and one has his nose coloured in using a Red Red marker. They are stamped straight onto the Whisper White card blank and I then used the sentiment from the same set which was punched out using the Decorative Label Punch and all stuck onto a strip of Red Real cardstock. I added a couple of brads which I had to create a little more wow. Sad to admit but another set I've had stashed away and not used for a long time - Peaceful Wishes also retired. These were also stamped straight onto the Whisper White card blanks. 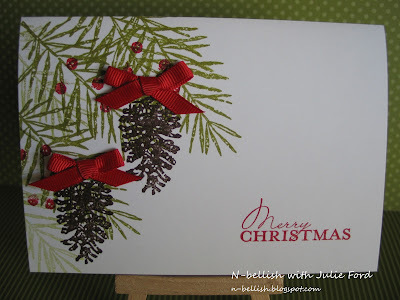 I used Old Olive and Green Galorefor the pine needle branches (I like the Old Olive much better! ), and Chocolate Chip for the pinecones. 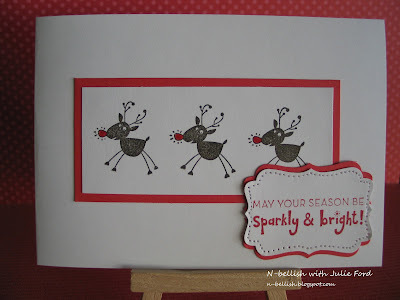 The sentiment is from the Contempo Christmas set (IB&C p 25) and stamped in Red Real Ink. 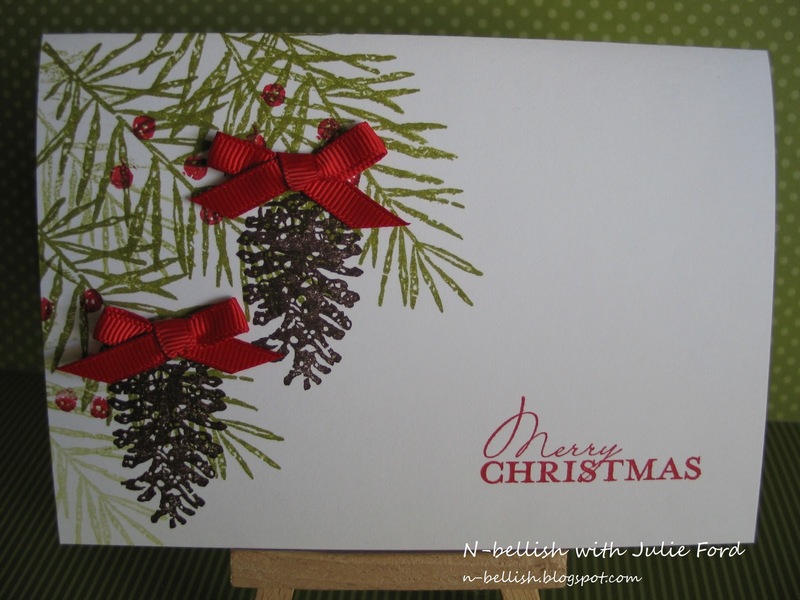 I added some bow on top of the pinecones using various ribbons and glue dots. 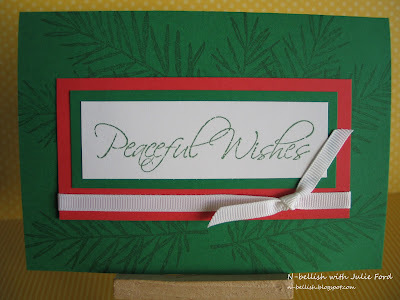 Here's another card made using the Peaceful Wishes pine needle brances and the sentiment. This was a super fast card to make. Welcome to the world Baby Ella. A colleague and close friend Annette from Canberra found out she was pregnant earlier in the year, about 10 weeks before we found out we were expecting our little man. It's been great having someone to talk to about those nigely little things! At exactly 10 weeks apart I was thinking it'll be nice as we had planned a trip to Canberra so I knew around the time this little one was due I would get to meet them - we didn't know if this little one was blue or pink until she came. Due to a few issues baby Ella entered the world 5 weeks before her due date and spent a few weeks in the hospital but I am pleased to say is home now with her wonderful Mummy Annette and Daddy Nick. I felt so privileged that when we were in Canberra for a visit last week we got to go to the hospital to meet baby Ella and it was in fact the first time she was allowed out of the nursery so we got to have a really close look at her. She seemed so tiny to me after having Noah who was a whooper at birth, but oh so cute. When I was deciding on a card to make I wanted to try something I hadn't done before and of course I'd left it to the last night before we were leaving! I choose to use the Baby Bundle clear mount set (IB&C p 54) and stamped the teddy bear, bottle and bib onto different shades of pink and celery cardstock which I then painstakingly hand cut before sticking them onto a square piece of Whisper White cardstock with an everyday glue stick. I ran the cardstock through my Bigshot machine using the Square Lattice Embosing Folder (IB&C p 157) making it look like one piece of textured cardstock. This technique does have a fancy name which I can't remember at this time of the morning! When I ran it through I accidently popped the side in upside down so as you can see it's actually indented rather than raised. 1 1/4" grosgrain ribbon to wrap around the three pieces of cardstock before mounting onto the final card blank which I made from Cake Crumb cardstock. Finally I stamped the baby pram onto Whisper White cardstock in Cake Crumb ink and coloured parts in using the markers - Pretty In Pink , Certainly Celery and Pink Passion. To accentuate parts of the pram I used a few brads and tied a bow from the same ribbon. I mounted the stamped image onto Pretty In Pink cardstock and then attached it using a few dimensional and a glue dot for the bow. 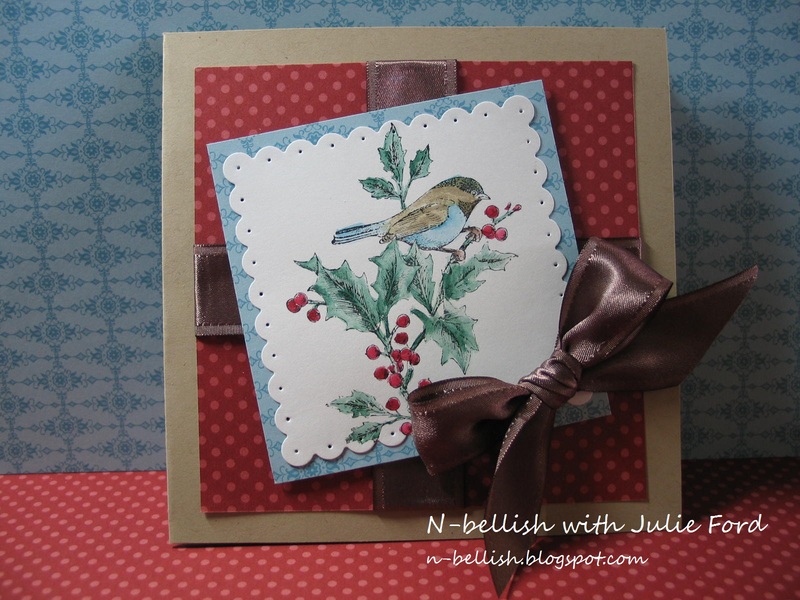 I loved the way the final card turned out and was so thrilled that it was well received. Although it was a little fiddley to make I'd certainly do it again! Tools & Embellishments: Paper cutter, bone folder, snail adhesive, dimensionals, glue dots, paper snips, clear block D, Bigshot machine, square lattice embossing folder, grosgrain ribbon, brads. Not so long ago I placed a call out for people to help make some Cards for the Troops and was very fortunate that my neighbour from Canberra Kerrie and cousin Louise in Adelaide made some amazing cards. It was so nice to see the different cards they made and I personally would like to thank them both. 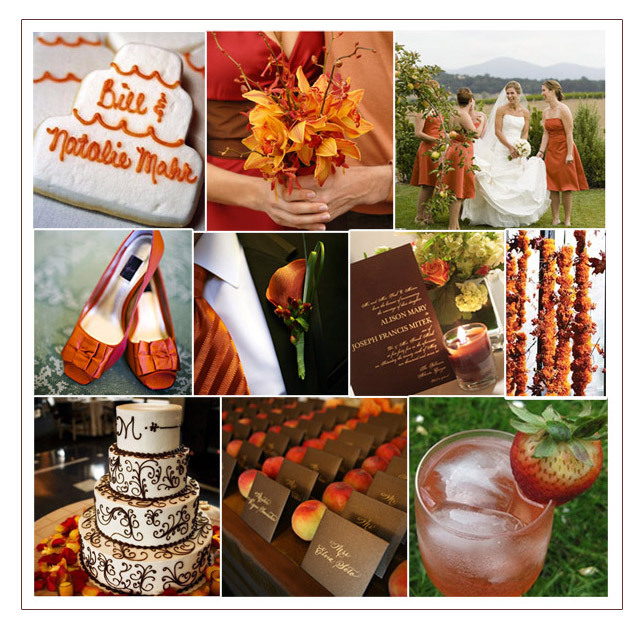 The cards most certainly don't have to be made using only Stampin' Up! products so if you've still got a little time and some Christmas themed products it's not too late to make them and send them on. Here is a couple photos of some of the cards Kerrie and Louise made. Aren't they just amazing - thanks again. Christmas Cards for the Troops at Adamstown. I've had a number of people contact me about Christmas Cards for the Troops 2011, so thought I had better let people know what's happening this year. 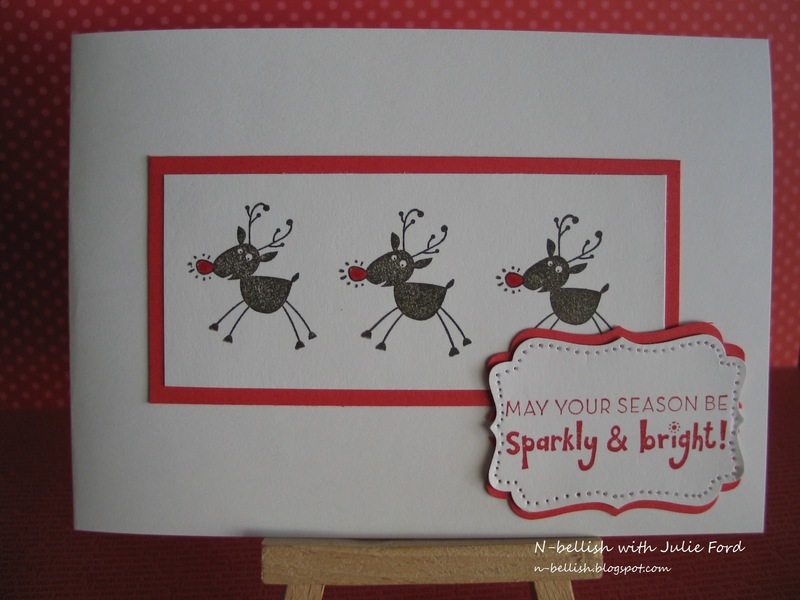 If you're close to Williamtown Base, Newcastle, we are having a card making event sponsored by Stampin' Up! and being co-ordinated by Tracey. 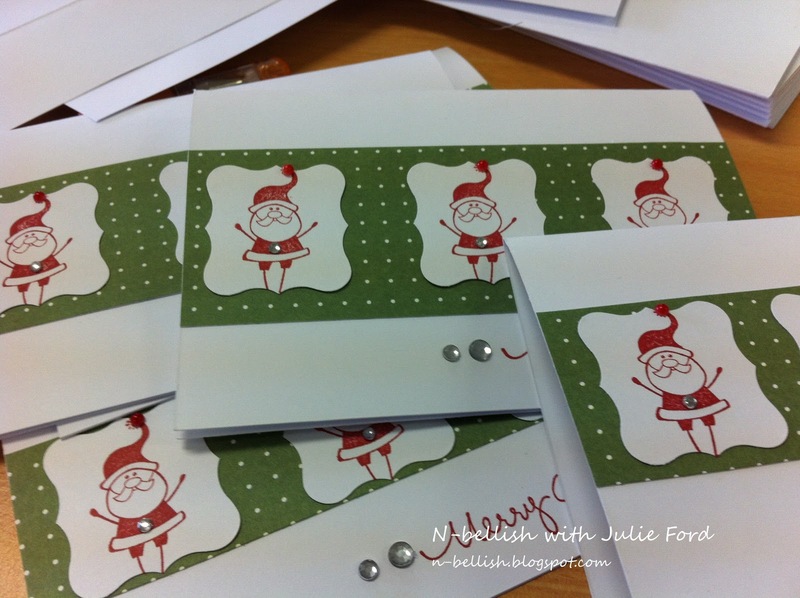 The event runs from 10am onwards and the goal is to make more than the 3500 cards made last year. We do ask that you bring with you adhesive and tools to use - please make sure these are clearly labelled, as well as any stamp sets you might like to use / share on the day. All cardstock will be supplied. As I do know that many people work and won't be able to make this event I have already run and will be happy to run another two to three evening working groups to make some more cards. This will take place at my house which is located in Adamstown, on Tuesday evenings from 7-9pm. Dates to be confirmed depending on how many people are interested, as I would prefer no more than 8 people per night. I will provide all necessary items to make these cards, except for adhesive, which if you don't already have can be purchased from me. Harrison's Little Wings Charity is another amazing charity that provides support for families that loose a little one. The wonderful Melanie McKenzie started the charity after she lost her little bub Harrison after such a short period. They do have a website which is fantastic as it provides a number of links to where you can go to seek assistance. The site is http://www.harrisonslittlewings.org.au/Home.html so don't forget to check it out. Tonight they begin their October online auction through their facebook page so drop over and make sure to place a bid or two on my cards. 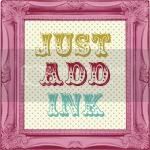 Each of the cards is handmade by me and is made using Stampin Up products. They are all blank inside so that you can add you own sentiments. There is an assortment of 23 cards - baby, birthday, thank you, Christmas, get well and more. All perfect for various age groups. If you're keen to make your own cards don't forget that you can order your items directly from me, just email me and I can give you a run down. 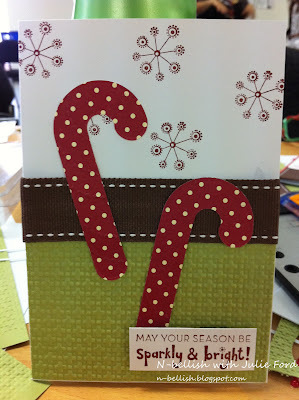 Just a quick one but I am very thrilled to say that the cards I made for the LAMB auction ending up selling for $61. I was so excited watching the auction bids each day. This $60 means that LAMB are able to provide 6 more miscarriage bags to families within Australia that have to go through the sadness of loosing a very special loved one.